Pull together this healthy Dump-and-Bake Turkey Shepherd's Pie with just 5 ingredients and about 5 minutes of prep! Preheat oven to 400 degrees F. Spray an 8-inch square baking dish with cooking spray. In the prepared dish (or in a separate bowl), stir together turkey, vegetables, gravy and thyme. Top with the mashed potatoes, starting around the edges to create a seal to prevent the filling from bubbling up. Smooth with a rubber spatula or wooden spoon. Line a baking sheet with foil or parchment and place the dish on top (this will help to catch any drips). Bake for 25 minutes, or just until the potatoes begin to brown. Remove to a cooling rack and allow the dish to rest for at least 5-10 minutes before serving. Can Turkey Shepherd's Pie be made in advance? Absolutely! This is a great make ahead dinner recipe! Just assemble the dish as instructed and keep in the refrigerator until ready to bake (up to overnight). You can also freeze the assembled casserole before baking to enjoy at a later date. It's a great freezer meal! 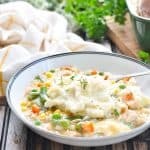 Can you cook Turkey Shepherd's Pie from frozen? Yes! It just takes a lot longer! You can thaw a frozen shepherd's pie in the refrigerator overnight, and then proceed with baking the thawed casserole as instructed per the recipe. Alternatively, to cook from frozen, cover with foil and bake at 350 degrees F for 1½ hrs. Increase oven to 425 degrees F, uncover and cook for about 20 more minutes, until golden and bubbling. Swap out the diced turkey and use diced, cooked chicken (such as a store-bought rotisserie chicken) or even cooked, ground beef, ground lamb, ground chicken or ground turkey (you will need about 2 lbs. of raw ground meat to equal about 3 cups of cooked meat). Pick your family's favorite vegetables! I use a frozen mixed vegetable blend that includes corn, green beans, peas, and carrots. If your family prefers just peas, or just peas and carrots, for example, use those instead! If your kids love cheese, try sprinkling some grated cheese over top of the potatoes before the dish goes in the oven. Lighten Up! With a fat-free turkey gravy and chopped turkey breast, this is already a very healthy dinner. To make your healthy shepherd's pie even healthier, feel free to swap out the mashed potatoes with an equal amount of cauliflower mash. You'll need about 3 1/2 cups of cauliflower mash to replace the potatoes. For a shortcut, try using frozen mashed cauliflower that has been thawed (such as this version by Green Giant). What goes with Turkey Shepherd's Pie? or dinner rolls, French bread for soaking up the gravy, or homemade 3-Ingredient Buttermilk Biscuits.